Nominal groups are collections of nominal accounts that are used to output values in the set of accounts. The nominal groups list is a list of nominal groups in the chart of accounts for the current set of accounts. From here, you can see the balance for the nominal group. That is, the sum of all the postings to nominal accounts in that nominal group. To view the nominal groups list, Trial Balance > Nominal Groups. Create, Edit or Delete a journal. View details of a nominal group balance. To do this, simply click the relevant row. 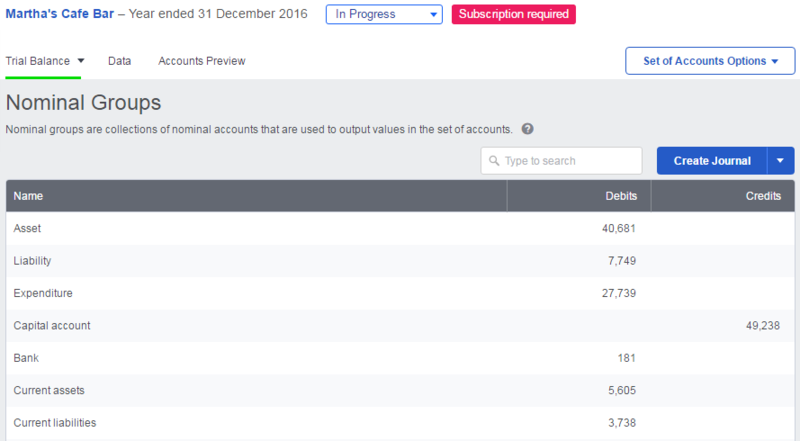 If your client uses Sage One Accounts or Accounting, you can populate a trial balance automatically. Search for a nominal group by entering a term in the search box at the top of the list.